To delete records, select Tools → Clear Data in the menu. You can specify a period for deleting data on documents printed: last day, last week, last month, last year, or all documents printed before a specific date. You can completely delete printing history data, or you can delete only document images from the database. In the latter case, all other data on documents printed will be available for viewing. To set up automatic clearing of printing history data, select Tools → Database in the menu. 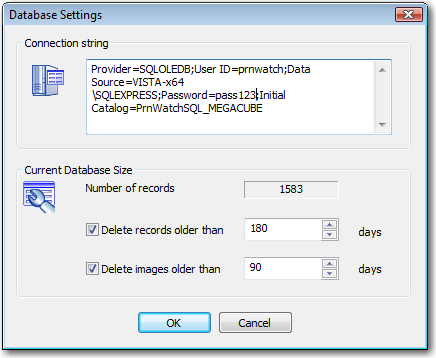 Delete records older than — Specify the number of days for keeping data in the database. Delete images older than — Specify the number of days for keeping images in the database. If you set up automatic clearing of printing history data, full records (or document images only) older than the specified period will be deleted every day at 00:00. 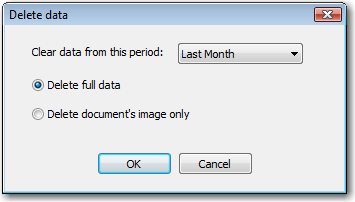 IMPORTANT: The period of keeping document images cannot exceed the period of keeping full records.